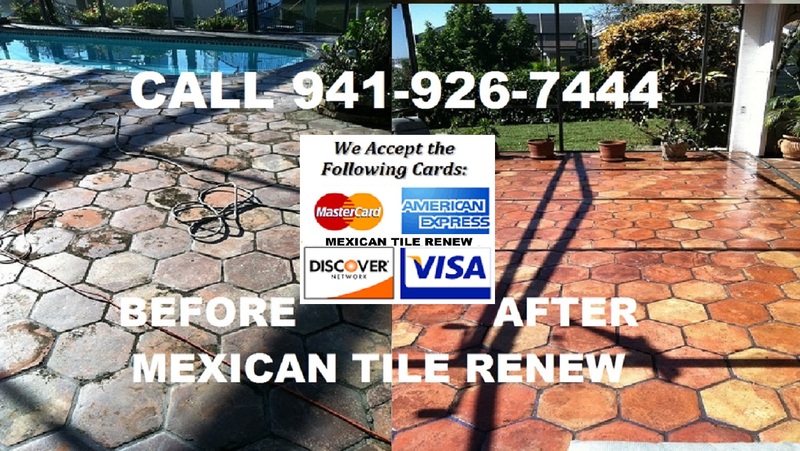 Mexican Tile Renew Sarasota Fl: Mexican Tile Renew Project in Sarasota Fl Where Tile Floor Was Below Grade and the Tile was Covered in White Spots or Efflorescence. Mexican Tile Renew Project in Sarasota Fl Where Tile Floor Was Below Grade and the Tile was Covered in White Spots or Efflorescence. Mexican Tile Renew Project in Sarasota Fl Where Tile Floor Was Below Grade and the Tile was Covered in White Spots or Efflorescence. Under certain circumstances, a white powder can form on unglazed terracotta type floor tiles. This is a natural phenomenon call efflorescence. It is due to soluble salts rising to the surface from the concrete slab. When they dry out on the surface, the remaining salts appear white and powdery. Mexican Tile Renew Project in Sarasota Fl Where Tile Floor Was Below Grade and the Tile was Covered in White Spots or Efflorescence. Efflorescence is a crystalline deposit on surfaces of masonry, exterior Mexican tile, stucco or concrete. It is whitish in appear­ance, and is sometimes referred to as “whiskers”. Mexican Tile Renew Project in Sarasota Fl Where Tile Floor Was Below Grade and the Tile was Covered in White Spots or Efflorescence. Efflorescence has been a problem for many years, and is a topic of much controversy. The formation of these salt deposits are not mysteries. They are, for the most part, water-soluble salts that come from many possible sources to mar and detract from an other­wise beautiful and serviceable structure. First of all, there must be water present to dissolve and trans­port the salts, remove the source of water and your almost there. FOR SUCCESSFUL MEXICAN TILE RENEW PROJECTS ANY SOURCE OF WATER MIGRATING UP AND UNDER THE TILE MUST BE REMOVED. Efflorescence, the white spots, that formed along the exterior edge of the patio in photo above on left. Naturally, Saltillo tile is not terribly strong or hard. Although it is comparable to other natural stone tiles such as slate or granite it can chip and crack. 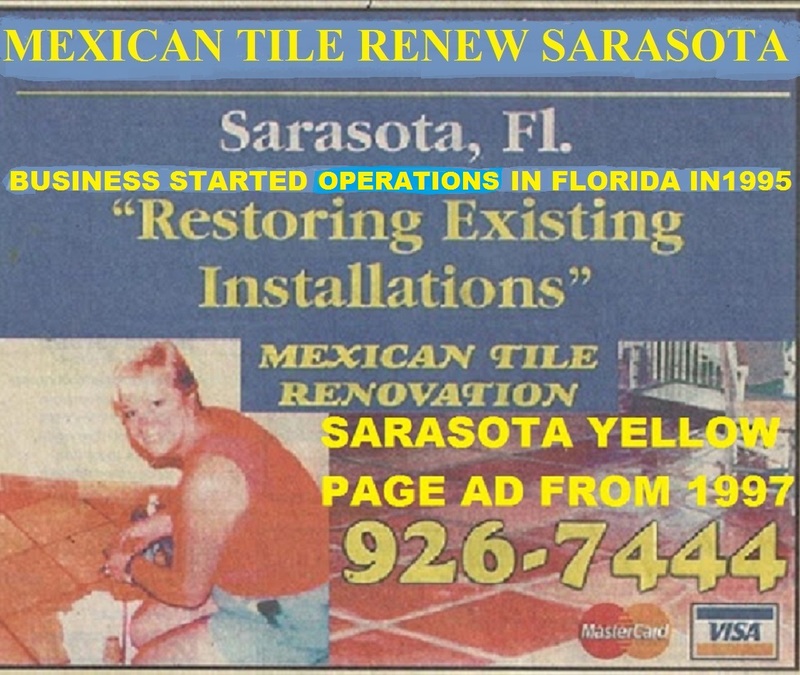 Labels: Mexican Tile Renew Project in Sarasota Fl Where Tile Floor Was Below Grade and the Tile was Covered in White Spots or Efflorescence.